What it is: Finally Fall is a new collection, released at CHA Summer by Bella Blvd. This collection is full of sweet hand drawn images, rich colors and OWLS! They pretty much had me at the wood grain and owls, I'm not gonna lie. There's also pumpkins, apples, trees, sweet little clouds, and the cutest little houses... all the things that come to mind when thinking of Autumn. And for those who aren't into the grungy, vintage look, this collection has the bright graphic patterns that you are looking for. -The bright colors! I love the vintage look, now and then but I prefer the bright bold patterns. -The owls and wood grain!!! Two of my very favorite things! -The paper has the perfect weight. Its not too thin, and not too thick and its double sided! Can't beat that! -I'd like to see a few more journaling spot options. 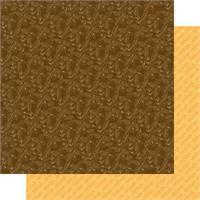 Supplies used: Paper and Cardstock stickers- Bella Blvd. 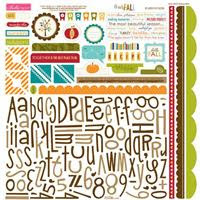 Overall, this is a GREAT collection for scrapping all your Autumn photos... pumpkin patch, Thanksgiving, raking leaves... I love the bright fun colors and the bold, hand-drawn patterns! Are you eagerly awaiting the arrival of this collection to your favorite shopping spot? Do you love the patterns(especially the wood grain and owls, like myself)? Or is this collection, not your speed? Let us know! We'd love to hear what you think! Leave a comment by midnight EST on Thursday to be entered to win this collection!! Ooh! Love the letter stickers & the trees paper! The font is really cool! Eagerly awaiting this line to appear is an understatement. Heard so much about this line and it looks just perfect. LOVE the color scheme, clouds and woodgrain. GREAT job on the layout and card too. Right into my FAVE folder. This collection is definitely my speed! Love the woodgrain and the trees- don't know which side I'd use first! 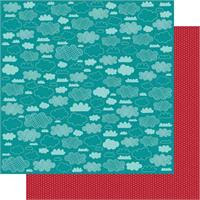 And I love the blues of the cloud paper too. I'm with you on the font- I think it's fabulous! Fall is my favorite season, and I'd be so happy to actually win this line. Thanks for the chance! Oh I really love this collection! I just love the Fall! This is a great fall collection. Love the colors and patterns and that alpha looks cool. love the owls, pumpkins, and woodgrain! ADORABLE! I love the projects you made with it....they really show off the line. I think I have a seasonal paper "problem"....love them all! I love everything about this fall collection - the cute owls, woodgrain, great colors! Perfect for scrapping my upcoming New England trip!! It's adorable!!! Would love to win, thanks, and great review! 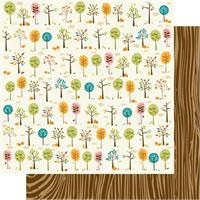 I particularly adore the woodgrain papers...we live in the mountains and this would be such a neat background for some "playing in the leaves" photos! I love the bright colors and the pop of teal. I want some for my pumpkin patch layouts!!! Bella Blvd - 'nuff said! LOL...I love everything that Bella Blvd come out with. Their designs and colors fit me perfectly! I don't naturally gravitate towards fall colours but I need them for fall layouts, masculine cards and a few other things. I'm always searching my stash when I need these colours and coming up short. So I'm thrilled to see such a fun, bright but fall coloured collection. Hope I win!! I love this entire collection and have a few pieces in my shopping cart at A Cherry On Top! ALWAYS love Bella's lines...the colors are always the best, and the designs so whimsical! Yup! I love the woodgrain too. Hope to win this. This is fabulous! I can't get enough woodgrain and cloud papers! I'm in LOVE with this line! It was supposed to come with a kit that I was getting, but it wasn't ready in time to make it in the kit so I would LOVE to win this!!! I'm lovin' the color combo!! so many fall collections are earthy.. and where this one encompasses the gentle earth tones it also has bright bold colors! It's a really great collection. Perfect for documenting our yearly trip to the pumpkin patch. Thanks for the chance to win. I love this line especially the font of the letters. The colors are fabulous! I loved One Fall Day last year and I'm sure I'll love this one too! Darling collection and I do love the font! I agree though that I would like more sticker letters...I always run out! I have to echo your sentiments exactly! this is definitely a great collection for scrapping Autumn photos! The colors are so much fun. This is one fabulous fall collection! I love the brighter color palate, especially the blue! This would be so fun to play with! I'm with you---love the wood grains and the owls! You say Bella and I am all over it, Stephanie never fails in her designs, she cranks out one gorgeous line right after the other. I am waiting, oh so not very patiently, for it to hit the lss so I can grab me up some! So much fun. Reminds me of taking my kids to the pumpkin patch for stories (while sitting on hay drinking cider) and picking out that perfect pumpkin! This is my favorite release of theirs! Thanks for sharing! Love this collection...it's definitely my speed! Wow!!!!!!! I just think Bella Blvd lines are always so versatile. I love the patterns & colors and most of all the stickers and tag page! I love Bella Blvd and fall is my favorite season so this new line is exactly the greatest! Love this collection. Lots of fun patterns and colors. Definitely could use it! oh, I love anything autumn themed. all those gorgeous colours - it looks wonderful. I love this collection, Fall is my favorite time of year so anything fall or harvest related is a must. What a cute collection! The colors are perfect for fall photos. And the letter stickers are adorable. Love the fall colors and what you made with them. After seeing the review I tried to buy this kit at my local stores but they don't have it out yet. Your review sold me on it. I really hope I win it. Its so cute! Love this! Looks like a fun line! What a great bright colours. Love it! Shold be fun to play with it. You made some great projects with these papers. Not too bad. I would like to see it in person! Everything is better in person! LOL!